At the dawn of a new year, one of my hopes is to realise my ambition to publish Honor’s Ghost, my new novel. And, of course, I also fear the disappointment of hopes dashed…. Honor’s Ghost is all about hope… specifically about the universal hope that our children won’t inherit our fears and repeat our mistakes. Honor’s marriage is fracturing, under a network of pressures, and her long dead ancestor, Annie, wants to help her. She is trying to warn Honor not to repeat a destructive pattern of dynamics in her marriage. Hope: can we agree what it is? Hope springs eternal… But why? Throughout history, there have been numerous symbolic representations of hope: butterflies, swallows, anchors, shells, rainbows. Each post will be illustrated by an original artwork, based upon one of these symbols, painted by Melanthe Grand. 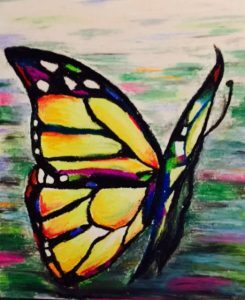 This first image of the enduring symbol of hope, transformation and new beginnings represented by the butterfly, suggests that there is more to life than the current reality and the current moment, like the caterpillar before it transforms into the beautiful butterfly. Who would ever look at a caterpillar and believe it could fly? I hope you will join me, and add your own thoughts and experiences to the discussion. Watch out for the first post, next week: Hope: can we agree what it is? Meanwhile, feel free to share what you hope and dream of in 2015… and finally, and a little belatedly, Happy New Year! This could be the last time….